Hello everyone ... I had the pleasure of going out on a guided tour so to speak of a creek near Summerville, SC and it was a hoot. A few cool things to be had but really the highlight of my day were these little colorful Hemi teeth. The best one was the pathological Hemi with a twisted root and malformed crown ? Thanks to Dennis and Shawn. Beautiful hemis and excellent photography to show them off to their best. Thanks Ken .. apparently the direction you place these teeth on the scanner can have a huge effect on the quality of the color in the image. Thanks ... it was my first time and it was great. Cold and backbreaking .. but great. I found a 2" orange 3/4 frag-ladon but it was my first 'almost complete' tooth so I was pretty stoked. You'll get your first complete meg before long. Then you'll be on to other items on your fossil wish list. A few more from a different spot ..... the preservation was good in this spot. Not too much water worn enamel. Yup. Those teeth are in really great shape with some nice color. I found some nicely preserved hemis in the Peace River last week though the colors are much darker. Yeah, the colors were nice .. though I'd still like to make it out to the Peace at some point in the future if only for the change of scenery and excuse to get into my wetsuit again. Your trip reports were great btw. Here are a few of the larger teeth that made an appearance .. 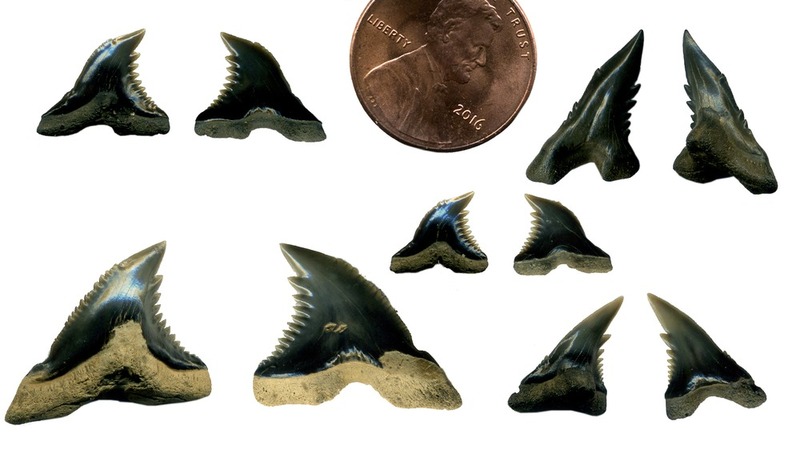 The Megalodon, White shark, Mako, and I 'think' the remaining two are Angustidens ? I'm still a bit iffy on the id when the cusps are missing or hard to see. Here is one that is easier to identify. The best so far for the week, until I dropped it. hahaha .... I'm such a klutz. Nice collections you have going! The bottom photo is definitely Angustidens as at least one cusp is clearly visible. The bottom right in the top photo is not serrated so I'd guess not meg/angy. I'm way out of practice on my IDs though... IIRC Makos do not have serrations so that would be my guess. If I may ask, what scanner do you have? Identifications are a bit easier for Peace River fossils as angustidens doesn't really seem to show up this far south. If you search the forum you'll find some of the chronic Peace hunters like @Shellseeker showing megs with hints of hints of cusps but I believe the current wisdom is that they are are either older transitional megs (losing the final remnants of cusps) or aberrant megs where the vestigial cusps make a faint reappearance. It's funny how my fossil knowledge is like groping around in a dark cave with just a small candle for light. I'm vaguely aware of various Peace River fossil finds that I read about on TFF and then soon lose the specific details. Once That limited knowledge helps me to inquire more when I find something odd. When I come across a rarity (whale tooth, ground sloth molar, etc.) I then focus my attention on that item and learn all I can about it. As a result, I come to know all I need about the more commonly found fossils and add a bit of knowledge about the unusual items one find at a time, incrementally gaining a sliver of knowledge here and there. Were I to pull a meg with hints of shoulder cusps out of the river, I'd researching all I could on that topic. Further north you have to deal with the possibility of angustidens as well. The feature there is of course the side cusps. I always check my megs (broken or not) for any hint of interesting shape at the corners of the blade just to see if there are any visible bulges there (none so far). I would suspect that these cusps might break off so meg-like teeth from the Carolinas should probably be checked for any signs of small breaks where the cusps might be which might indicate a hidden angie. I'd like to get up to hunt the Carolinas some time in the future as it would be a hoot to pull one of these from the creeks (mainly because we can't find them down here in Florida). 1) Extremely water worn meg. The serrations on the blade have been rock tumbled away. I wouldn't think mako mainly because there appears to be the remnants of a bourlette on the lingual side. 2) Great White. The shape is like that of a mako but with obvious serrations. 3) Meg. Some serrations left and obvious bourlette but I'm not seeing any signs of side cusps or indications they once were there. 4) All signs point to meg but the broken edge where a cusp might be makes me think this might be an angie. Of course having no experience with this species makes me cautious. 5) Definitely screams mako blade. 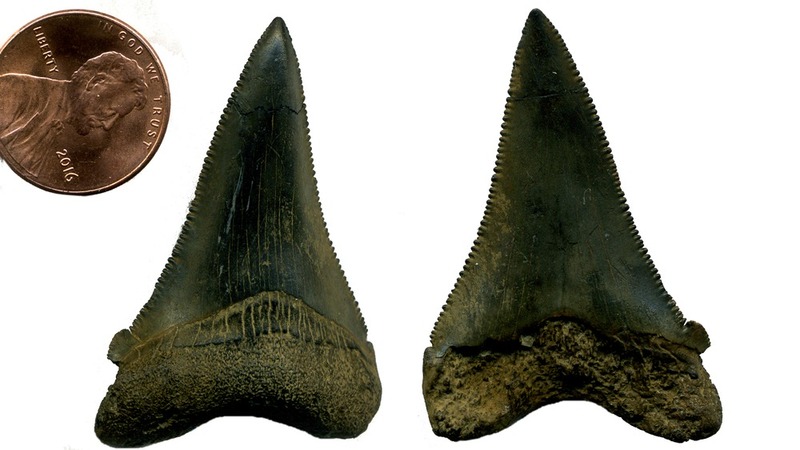 Don't know if any of this was the least bit educational but it is the extent of my (current) knowledge on the larger shark teeth. I too like the nice flat lighting that imaging with the use of a flatbed scanner brings and wonder what model of scanner you are using. Also, what imaging software are you using to composite the reverse faces together into a single image? Photoshop or something simpler? BTW: If you ever find yourself down in Florida during the dry season when fossil hunting in the rivers is possible (usually late November or December through May or even early June) let it be known on the forum. There is usually at least one Florida TFF member who is in town and available to host a fossil hunt in the Peace River for out-of-town TFF members. The Peace River really is a hoot to hunt and we enjoy sharing the experience. I would add that typically here it's not known as far as I know to see megs and angies in the same strata layer but if you are finding these in the bottom of a creek or river there is no telling where they washed from so I wouldn't rule out finding them together. I haven't been hunting long enough and I'm not a diver so I haven't hit rivers (yet LOL). I haven't heard of any transitional megs here yet either but again, I'm really new at this. Thanks for all the great info Ken! Yup. Hunting in rivers or anyplace that the fossils have lost their in situ context tends to jumble things together. 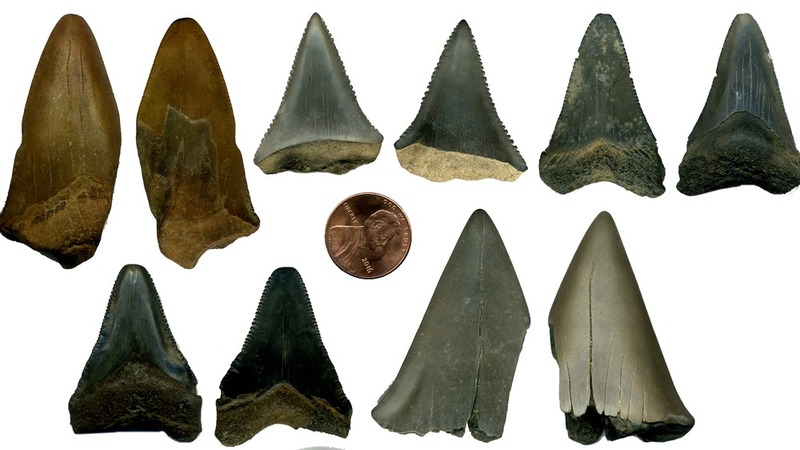 This is really apparent in places like the Peace River where a single shovel full of gravel can turn up marine fossils (meg and other shark teeth), freshwater fossils (turtle shell & gator teeth), and terrestrial fossils (horse, camelid, proboscidean). Throughout the ages many locations in South Florida have been a shallow marine environment (interglacial periods), an everglades-like or riverine environment, or an open grassland (or even forest) environment--and in fact likely cycled through these repeatedly. Unless the deposits were reworked, I wouldn't expect to find horse teeth and shark teeth at the same fossil strata but we certainly find them mixed together when we hunt the accumulated gravel beds in the river. I presume that in the Carolinas the megs would be found in the higher strata and angies and rics would be found in older lower strata--and possible transitional forms, it would seem, should be found between these. I've only encountered megs down here in Florida so my knowledge of angustidens and auriculatus is pretty weak. The scanner is an old dinosaur ... that probably came out in the year 2000-2005 ? An Epson Perfection 2480 Photo scanner. I've kept it all these years and can still 'barely' find driver software. I don't normally toss things that still work perfectly fine. I'm scanning at 600dpi resolution and then resizing to 1920x1080 HD screen resolution (72dpi) after some editing in Photoshop. Though .. if you are looking for free image editing software GIMP works great and has all of the tools that you would need for basic editing. I've been using Photoshop essentially since its release date so it is always my go to tool. @digit Ken, I appreciate the thoughts on the teeth .... I kept thinking they might be small megs though like you I'd like to make sure and do my research before any definitive answer. The changes in morphology over time is amazing and I love to delve deeper once I hit upon a problem with an ID or have a particular piece that seems intriguing. Thanks again for the insights and the link ! 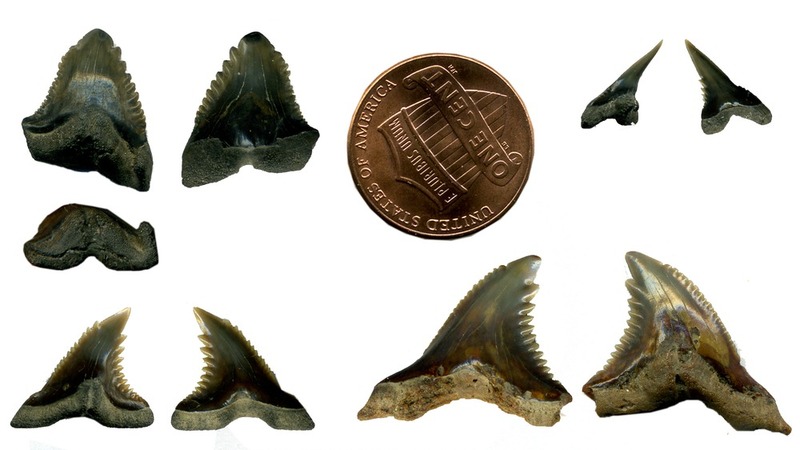 Yes, Angustidens is the great grandpa of the Megalodon My assumption was that as well ... but these teeth are all from the creek bed so they have been having this inter generational dance for some time haha. Yes, megs are younger thus higher in the strata than angies are. Not many rics though. Everyone once in a blue moon someone finds one. Hopefully some day Toby or I will find one but I don't really expect to see one. Ashley Formation is limestone/marl is about 26 mya (early Oligocene). Above that is the Chandler Bridge Formation but it went through several phases. The lowest phase was Marine. Above that is "marginal" marine. Above that is bay/estuarine and the top layer of Chandler Bridge is fluvial/esturarine. On top of Chandler is the Edisto Formation and then Ten Mile Hill Beds. Chandler Bridge dates to about btwn 23-24 mya (late Oligocene). That information comes from Bobby Boessenecker, PhD from a presentation he gave at a Palmetto Paleontological Society meeting recently. We have found in gravel beds in these creeks horse teeth, partial megs, great whites, beauts of angies, lots of lemon, tigers, some sand tigers, and some gorgeous hemis. Plenty of bone frags too. Some fish vertebrae, shark vertebrae and even mammialian (marine and land) verts. Thanks for the info. I have and use GIMP all the time. Love it! I had Adobe Suite but can't find it so GIMP is a great replacement for it. I had a great scanner but after the Windows switch to like 7 or 8 there was no software to make it work. I suppose I should have gone Linux after that but I'm too lazy. I may have to bite the bullet and get a new scanner as there have been many times were I've needed one and cameras just don't always do the trick. I never thought to scan fossils though! What a great set of images you have! Hopefully you can keep finding software you need for that scanner for a long time to come. It's doing an excellent job for you! In a bed - gotcha! I wasn't sure of the context of the hunt. I love creek hunts. Going to change gears (probably this weekend) and try beaches. We haven't really done that yet so it'll be great to try something new. Did it once while camping at Edisto Beach State Park. There is an awesome ranger there that is a paleontologist and does hunts with visitors. We didn't have much luck but that was before Hurricane Matthew. Hmmmm... maybe if we don't have much luck with Folly this weekend we can drive down to Edisto next weekend. That information comes from Bobby Boessenecker, PhD from a presentation he gave at a Palmetto Paleontological Society meeting recently. You are lucky to have @Boesse in your area now and I'd not miss any presentation from him. Edisto Beach is awesome can be a great place to find sharks teeth but predominantly cool bone material. It's nice and dark too. If you can make low tide the Edisto River inlet as you walk north along the beach was where I have had the most luck. It is daunting though, the shell material is everywhere in huge piles but the teeth are there if you look hard enough. I enjoy knowing him. I'm now a CofC student where he and his wife work. I had been working on a fossil in the CofC natural history museum but since the Hurricane my availability greatly decreased. I've only been there a couple times. :/ Hopefully I can finish the fossil for them sooner rather than later though. 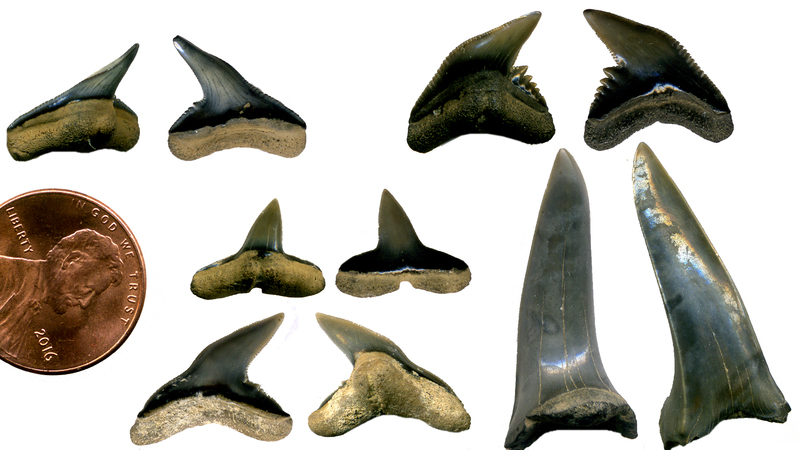 Last but not least I finally got around to scanning some of the color from the Tiger, Sand Tiger, and Lemon shark teeth.